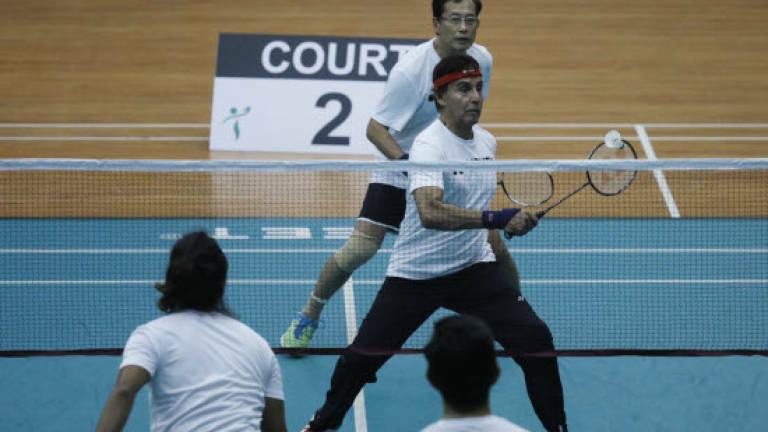 16 Jul 2018 / 12:00 H.
KUALA LUMPUR: A host of local celebrities came together over the weekend at The Forever Grand Asia Celebrity Charity Badminton (GACC) Sdn Bhd friendly tournament to raise funds for children with cerebral palsy. The event at Stadium Titiwangsawas was to raise funds for the Spastic Children's Association of Selangor & Federal Territory building development projects. Event co-organiser Yayasan Kebajikan Artis Tanahair (YKAT) president Datuk Irwan Shah Abdullah, better known as Dj Dave, said he was heartened by the turnout of the tournament. "I am glad some celebrities were enthusiastic to come and play for charity, this is a good sign," he said. He added that he has always been passionate about supporting charity events like these and has organised a few in the past. "I agreed to host this in the name of charity, I have always been passionate about it and I hope we can keep this momentum going to organise more in the future," he said. The event saw about 40 celebrities and many other members of the public participate in the event, which went on from 9am to 5pm. Malaysia badminton legend Foo Kok Keong was also there to officiate and witness the tournament. The tournament had two categories, Men's doubles and women's doubles. Malaysian Shakilla Khoriri and Faye Kusairi bagged the gold for the women's event. The men's doubles pair of Zulfari Abdullah and Nornikman Hussin took home their respective gold. Also competing were celebrities such as Fizz Fairuz, Andy Lok, Riot Kool, Linda Onn and Carrie Lee.